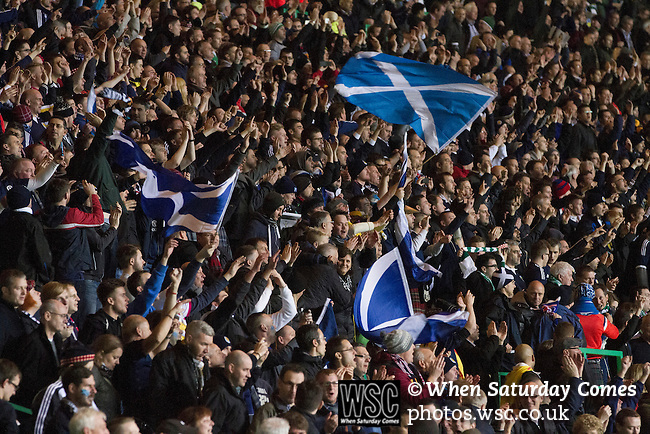 Scotland 1 Republic of Ireland 0, 14/11/2014. Celtic Park, European Championship qualifying. Home supporters reacting with delight at the final whistle of the European Championship qualifying match between Scotland and the Republic of Ireland at Celtic Park, Glasgow. Scotland won the match by one goal to nil, scored by Shaun Maloney 16 minutes from time. The match was watched by 55,000 at Celtic Park, the venue chosen to host the match due to Hampden Park's unavailability following the 2014 Commonwealth Games. Photo by Colin McPherson.